The Ez Scrub Bug Block is just what you need to remove stubborn bug and bird poop from your vehicle. Take the block soak it in soapy water until lis softens. 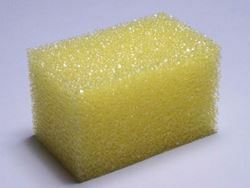 Add some bug remover if needed to the sponge and start srubbing. The block will confirm to the shape of your grill getting your vehicle as clean as possible. This also works great removing scuff marks on the paint, kick panels or door panles. For stubborn scuffs use some fine grit compound and gently rub.